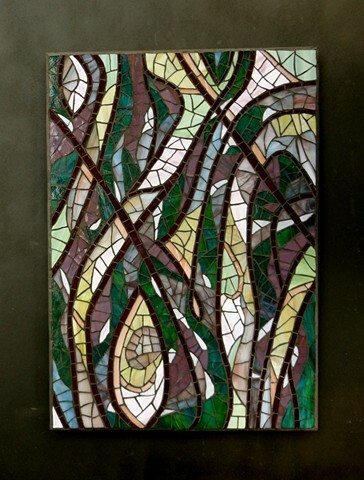 Watching the Rocky Mountains change in the spring when the first bright greens appear but before the snow leaves the gullies, I was inspired to do an abstract mosaic of the colours and lines I enjoy. Besides the signs of spring, the grays and purples come from the rocky outcroppings and the deep shadows while the black lines represent the geological slippage of the mountains, visible everywhere. The waving lines of the composition represent, to me, the weave of valleys, rivers, deciduous or coniferous forests from a "bird's eye view."